[Mathieu] needed to open up his Acer Aspire One to do a hard drive replacement and decided to add a bit of pizzazz while he was in there. 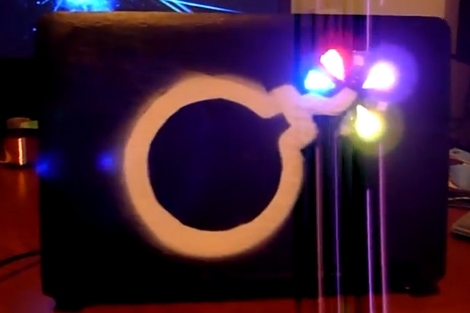 The image above is the lid of the netbook adorned with RGB LEDs and a spray painted stencil. He previously purchased a set of surface mount RGB packages on eBay and thought that they were perfect for this hack. after removing the case he found that by using a flex PCB he would be able to fit the LEDs inside, and pass the connections through to the main computer housing. The leads connect to a Teensy board, which is held in place with a liberal application of hot glue. [Mathieu] removed the USB connector and soldered jumper wires to one of the computers ports. In the video after the break you can see that he uses the programming software to write some code to the Teensy, driving the LEDs. We’d like to see it set to listen for serial communications and react accordingly. That way you could use it for notifications, as an audio VU meter, to track torrent progress, etc. The Acer Aspire One is a netbook that often ships with a Linux OS preinstalled. This is great for fans of open source as market share is calculated based on units shipped, not what users install after they buy the hardware. Unfortunately there is a pretty major flaw that can cause a “failed to initialize HAL” error as seen above. [Michael Crummy] came up with a set of steps you can use to recover from this error. So what is this error? HAL stands for Hardware Abstraction Layer and it’s what allows one user interface to communicate with many different types of hardware. 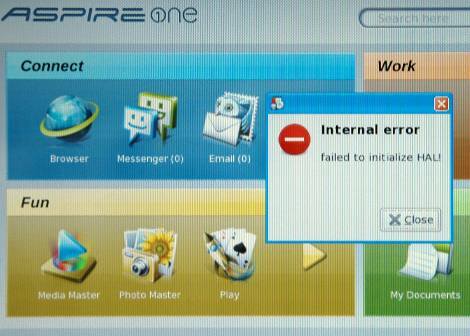 If you’re the proud owner of an Aspire One and are struck with this error you will suddenly find that you can no longer use the USB ports, card readers, wired or wireless network connectors, or the sound card. So you can’t connect to the Internet, and you can’t get any files on or off of the device using the currently installed operating system. For an OS that [Neal Stephenson] once described as “like the M1 tanks of the U.S. Army, made of space-age materials and jammed with sophisticated technology” this is a very big problem. We know what you’re thinking… boot into a live session on a thumb drive and get what you need from the hard disk. Well that’s all fine and dandy, but you shouldn’t ever be forced to clean install Linux to fix a problem. So check out [Michael’s] method and make sure you turn off the Acer live update server which was mostly likely the cause of the problem in the first place. External antennas on netbooks are notorious, from EEE PCs to the Panasonic CF-R1, but this is the first on an Acer Aspire One we’ve seen. [xRazorwirex] sent in his external antenna hack for the 802.11n capable D150, with the intention of increasing performance, but he says he can’t attest to any change. Unfortunately the lock slot had to be removed, but a small price to pay for a big increase in connectivity. The process seems simple enough, and could probably be done within a half an hour. Now that there is an external link why not build a Cantenna, hop in the car, and HeatMap the neighborhood! Gadget blogs have been a fluster the last day about TechCrunch stating that netbooks “just aren’t good enough“. Writing a response post hasn’t proven very hard given the number of factual errors in the original. Boing Boing Gadgets points out that the low-end of the spectrum that TC post seems to cover are almost impossible to purchase because they’re so outdated. Liliputing rightly states that comparing the browsing experience to the iPhone isn’t worthwhile since it’s entirely a software problem. Laptop goes so far as to recommend the HP Mini 1000 and Samsung NC10 specifically for their keyboard. TechCrunch isn’t alone in their opinion; this week Intel stated that using the ultra portable devices was “fine for an hour“. TechCrunch is designing a web tablet right now using the collective wisdom of blog commenters. Looks like they’re just reboxing a netbook for the prototype. We cover the netbook market for different reasons than most: Their low low price makes people much more willing to hack on the device. For the price of a smartphone, you’re getting a fully capable laptop. The low performance doesn’t matter as much since we’re running different flavors of Linux that are much lighter than Windows. People running OSX86 are doing it to address a market that Apple doesn’t. What’s your experience with netbooks? Do you have one that you adore or are you annoyed by their shortcomings? Models we’ve covered in the past include the Acer Aspire One, Asus Eee PC, Dell Mini 9, and MSI Wind. [tnkgrl] is back with part three of her Acer Aspire One hacking. This time she’s adding in 3G. You may look at the picture the above and think, “Cake. She just plugged the card in”. No, the Acer doesn’t ship with the mini-PCIe slot or the SIM card holder. First you have to solder a right angle mini-PCIe connector to the board pads and bridge two others to provide power. The SIM holder was another problem. She wasn’t able to find a pin compatible one. The one she installed is mounted to a riser so she could change the wiring order (let her know if you can find the correct part). This mod definitely requires some good soldering skills and she warns that even she managed to destroy a SIM in the process. The Dell Mini 9 is another netbook that doesn’t have the appropriate connectors soldered on board, but JKK has a work-around. You need a 3G modem that has the SIM card on board. You plug it into the WiFi slot after taping over a few pins and then use a USB WiFi card instead.